Roll out some advertising this Diamon Jubilee 2012 and you won't be disappointed!! Our Roller Banner Pens for Queens Diamond Jubilee are perfect to get your name out and about during this historical occasion. Simply roll out the advert and wallah! - Good exposure, full colour printing and your company details, or special offer is made available. Good quality blue ink inserts ensure this ballpen will last long and outperform many other pens in any customer's stationery set. 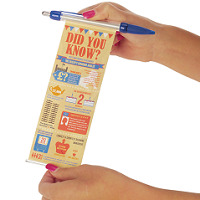 Hand these Roller Banner Pens for Queens Diamond Jubilee out or post to customers! For a FREE QUOTE, please fill in the form regarding our Roller Banner Pens for Queens Diamond Jubilee and we'll be able to help you. Why not have a look a our The Queen's Diamond Jubilee 2012 Products department for more business gifts? Why not have a look at our other Diamond Jubilee 2012 gifts?